Whether you buy just one canvas or a thousand, we offer the lowest prices guaranteed. We help you deliver the highest quality canvas prints to your customers, at the same time increasing you bottom line. We use geniune HP Vivera and Canon LUCIA inks along with a thick museum quality canvas to create a professional grade product that will last over 100 years. We are a high volume canvas printing company, but each picture of each order will be personally reviewed to ensure it is perfect. Your customers' satisfaction is guaranteed! We will soon be Lumaprints! With more great products to come, and a great new design! We have added extra functionality for our Pro users, such as the ability to upload your own logo that will automatically be placed in the white bleed on the back of the canvas, every time you order! Come check us out at Lumaprints! We take pride in offing the highest quality products and unparalleled customer service. Thats why many of our wholesale customers have been working with us for years. We are rated 5 Stars on both Yelp and Google. Read what other customers have to say about us! Canvas Memoirs PRO is soon to be Lumaprints! We are a high-volume canvas printing manufacturer. We produce our canvases domestically in the USA. Our costs are one of the lowest on the web, especially for our fantastic quality of our products because of the scale of our operations, not because we cut corners on the quality of our products. Our canvas prints are made using a thick museum grade canvas, and OEM Canon and HP inks. We carefully audit our suppliers and leverage our high purchase volume to get their lowest prices. In turn, we pass these savings to our wholesale canvas printing customers. We offer different pricing tiers where high volume purchasers get the lowest prices. Nevertheless, even if you buy one canvas, our pricing will be lower than other online prices you will find. 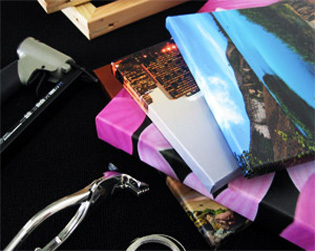 A lot of people selling canvases on the internet are resellers of our canvas products.